These small, poetic essays are written against the backdrop of modern culture, ecology and psychology. They describe an alternative and grounded way in which we might live our lives with depth and soul. This thought provoking collection offers a whole-hearted approach to the crisis facing humans on earth. Steve Thorp is an integral counsellor and poet. He works with individuals, groups and organisations to support soul-making and cultures of deep wellbeing. In the past he has worked as a teacher, psychotherapist, consultant and activist. You can find out more about his work at: www.21soul.co.uk. 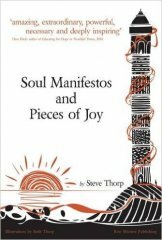 'Soul Manifestos and Pieces of Joy is amazing, extraordinary, powerful, necessary and deeply inspiring’, Dave Hicks, author of Educating for Hope in Troubled Times, 2014. Really lovely and so inspiring - a wonderful book indeed. There is something beautiful on every page.